4. ABAP Unit Test Meets Legacy Code. Finally done with week 3 of Open SAP course where we saw how to add ABAP unit testing in existing legacy code. We already had a great feedback back about Week 3 in this blog by Paul. I thought of applying it in one of near to actual scenario to see how it looks. I have few observations on pair programming which hopefully I will share via separate blog. newdate = gw_logond-gltgv + 60 . This concept now needs to be extended to another set of users whose name begin with YYY* and whose validity shall be for 45 days. Easiest and the worst solution will be to add mine YYY* user id and hardcode another 45 days with IF and ELSE stuff. But I thought of why don’t we implement it via unit test class, it will make every life easier, testable and flexible. The most important place in the code is where it decides whether the user needs to be modified or not that is where all action will happen. So started by creating our local test class with method ABC with parameters difference between number of days and username. So started by creating local unit test class LTC_USERVALIDITY with method test method USER_DAYS for testing. 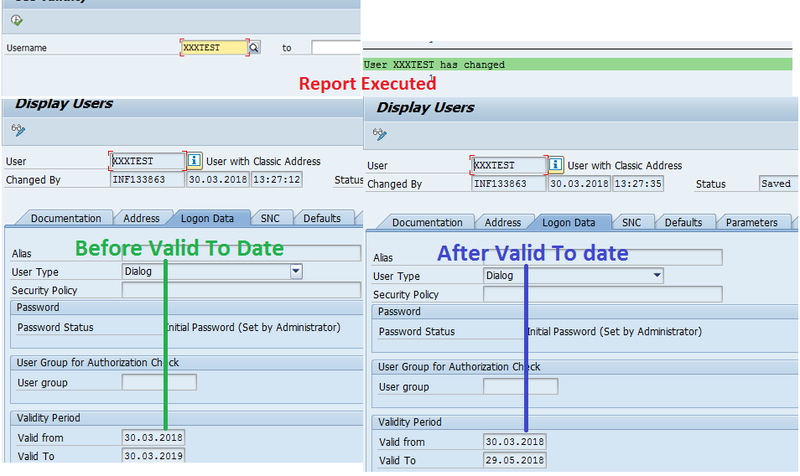 This method will pass Username, Number of days between creation and valid to date and creation date to determine whether a user needs to be updated or not. If update is required Y flag is returned along with calculated date. DATA: m_cut TYPE REF TO lcl_uservalidity. METHODS user_days FOR TESTING RAISING cx_static_check. m_cut = NEW lcl_uservalidity( ). IMPORTING r_result = DATA(checkvalue) r_newenddate = DATA(enddate) ). IMPORTING r_result = checkvalue r_newenddate = enddate ). A custom table for mapping username with number of days was also created. Then defined the actual method CHECK_USERENDATE_UPD_NEEDED to check from custom table whether a user needs to be updated or not. userdays TYPE STANDARD TABLE OF zuserdays. SELECT * FROM zuserdays INTO TABLE userdays. READ TABLE userdays INTO ls_userdays WITH KEY username = uname . r_newenddate = startdate + ls_userdays-zdays. *          to be changed or not if yes then calculate also. *          IF  gv_count GT c_limit. *            gv_newdate = gw_logond-gltgv + 60 . Clearly any change in report done does not matter by whom he/she shall be able to validate that at least this part of the code is not impacted by his/her change. Once the ABAP unit framework is set normally people tend to follow it, so hopefully this program will eventually become better with each iteration. Feel free to provide your feedback open to all ears. Just curious, why did you put all the tests into one method? If one fails, you wouldn’ necessarily know which one. Also, your new class is a local class to the report? Where does the test class go? A separate include? Test class goes as local include. Logically created one method as they are related tests, we can create different methods for logically different criterias. The ouput when you run shows the line number where it failed. firstly nice that you took the effort to make your own example and to write about it! Regarding the test method, I thought the same like Justin. Why didn’t you create separate methods? Don’t get me wrong, I really appreciate that you went the extra mile, therefore I want to provide helpful feedback (even though it might seem picky…). It would be nice to see your tests go wrong (red) once and what you changed about it, also a screenshot of all tests being green would be nice…just to put some more attention on the ATC part and to show your experiences with it. Just for the bigger picture, would it we possible to share the complete report with test class? as told in open sap wtc course, it should be easier to write a new test (a new test variant) compared to existing ones. With given test method it would be hard to do that as this test method would grow with each new test variant. From my point of view, there are two methods to improve your/our test code. First one would be to follow advices from Justin Loranger and Mark Wagener and create different test methods (and even different test classes). The other option would be to group similar test methods. I love reading comments like these. They make me remember why I read comments. Nice adds to the blog. Thanks Alexander for the great feedback. Grouping similar test methods logically is something i can relate to. This is the reason for sharing the experience to get 360 degree view. I would say: don’t worry about possible future use-cases now – they might never come! If you get a new requirement, e.g. with the new criteria, then is the time to think about how to implement it! I’m with you here -> don’t change the code (yet), but thinking is never a bad thing. Put your thoughts for you colleges (or for your future self) as comment in the code, for example “for more flexible checks -> use BRF+”. Thank you for a real world example!!!!! Nicely done. 1. Isn’t using all these hard-coded checks w/o a test seam (or mockup data) quite useless? (Although it seems you are going to talk about test seams on next part). Thanks Shai for the feedback. Please find below my response. Yes since as of now the scope is limited to these test cases.